Speed. It’s more than a service but quality of life today. Speed. It’s what makes life easier. Speed. It’s what makes life more productive. Speed. Does your internet service have it? At Phoenix Internet, it’s what we pride ourselves in, and you can take an internet speed test to prove it. Speed. It’s what makes your business our business. 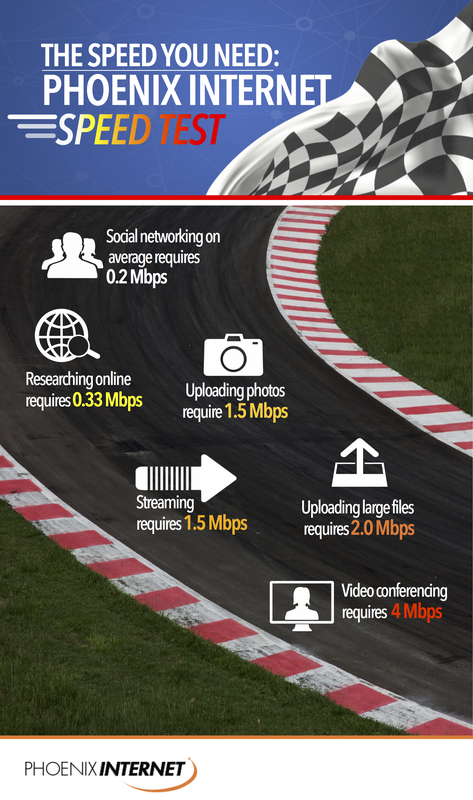 Here’s what you can do with the kind of speed we provide. Information. Any more people get a large part of their information from the internet. Feel sick? We look to the internet to help us determine what’s ailing us. Want to know where the best place to purchase a new appliance or just about anything else — go to the internet and Google it for comparisons. Want to find out how to lose weight in a week, turn to the trusted and true internet for your answer. The internet is loaded with information — whether it’s accurate or not is something you can also research on the internet. What’s important to you is being able to locate that information as quickly as possible to satisfy your curiosity. Social Networking. Who is doing what — that’s what we want to know. Who is sharing what — we also want to know that. Social media has taken off; it’s not only a part of our personal lives but our professional lives. It matters. Everyone is on it. You need to be able to share your thoughts, your pictures, your videos, and anything else as quickly and as easily as possible. You don’t want to wait for an upload that could take forever, you want to let everyone in on what’s happening right in the now — not later. Entertainment. Of course, who does not stream movies or videos today? It’s where we get so much of our entertainment, right there on the internet. Who needs cable? Well, maybe those who don’t have internet service with speed because — if the latter — watching a video can become a serious annoyance if it keeps loading over and over again. You need speed to fully enjoy entertainment on the internet. Marketing. Got a side business or a home business? The internet is your place for real-time, comparatively cheap marketing. If done right, you can have a thriving online business. But you need speed to upload large files or improve collaboration. You need speed to boost your productivity and scale your business faster. You need speed to take care of all things related to your business. Purchasing. That’s right, thanks to great marketing online, people purchase more than ever online. But if the purchasing experience is interrupted by poor connection due to limited speed, then you won’t be purchasing anything — it becomes frustrating. At the same time, you want to purchase online for the convenience of it. So, speed matters. Phoenix Internet, an area leader in high speed internet, offers 25 Mbps speed. At Phoenix Internet, we believe you should never pay for more speed than what you need, and 25 Mbps is more than adequate — combined with unlimited data, which makes the service all the more attractive. 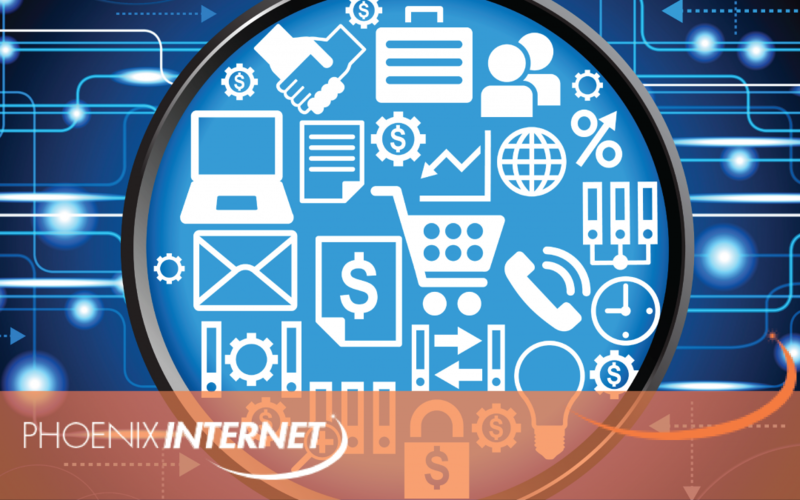 Don’t be fooled by internet services that claim to offer more. Here’s what you need to conduct all your activities online. Researching online requires 0.33 Mbps. Social networking on average requires 0.2 Mbps. Uploading photos require 1.5 Mbps. Uploading large files requires 2.0 Mbps. Video conferencing requires 4 Mbps. 25 Mbps more than provides for these things. Anyone claiming more is only trying to sell what they either can’t or you don’t need.